Fantastic teacher, very experienced, knowledgeable, and generous. She understands what you need to know, what is important, and provides that information. Lot of information packed into a mini class. How to get the right fit and style. I guess I knew this would happen someday. And of course it happened at Madrona. 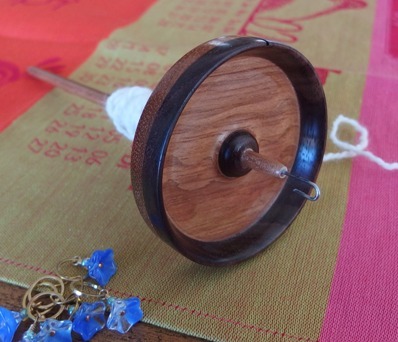 I was only curious about spinning; someone said I should see Sarah Anderson demonstrating in the rotunda. *Sarah Anderson* said with meaning and nods of approval all around. So I went to see Sarah Anderson. She was knowledgeable and encouraging and clearly knew what she was doing. 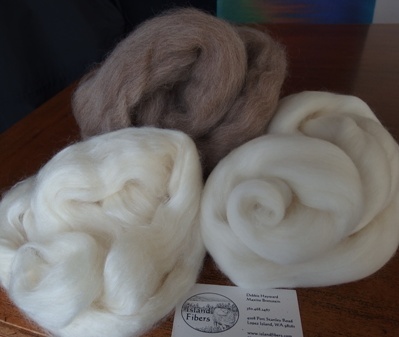 Someone else showed up, sat down and started spinning angora on a drop spindle. I said, “I don’t spin, yet”. “Yet”, they laughed. I don’t even know why that word came out of my mouth, but apparently they did. Next, someone walked up to talk about an upcoming retreat in the woods with Sarah, very rustic and inspiring. Next thing I knew, I was standing at a booth in the Marketplace looking at spindles, confused. The person looking at spindles next to me, decided to teach me to spin right there and then. At Madrona, these people just appear. And now I own this. 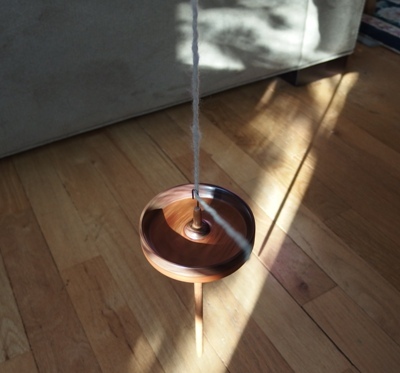 Around the corner, my new spinning teacher helped me pick out roving in beautiful natural colors. Typical Madrona, there’s always an expert, or twenty, around to show you how it’s done, and happy users ready to enable, with a Marketplace so you don’t have a chance to sleep it off. Entry filed under: Cool Things, learning, Madrona, Uncategorized. And so it begins, Grasshopper.